The Kármán line is an artificial boundary in Earth's atmosphere that divides space missions from aeronautics missions — passing the line turns a run-of-the-mill pilot into an astronaut. And this obscure boundary may become extremely important as we enter the era of space tourism. A plane, aircraft, or other object relies on the density of the atmosphere to keep it aloft. The atmosphere thins as the distance from Earth increases, forcing a craft to increase velocity in order to stay airborne. This push and pull can be illustrated by an equation proposed by Theodore von Kármán, with the eponymous line becoming the distance from the planet at which a craft must meet or exceed orbital velocity in order to prevent a loss of altitude. Kármán rounded his initial calculated result 100 kilometers, and, in the process, selected the boundary by which pilots and passengers become astronauts. Theodore von Kármán is an interesting character whose legacy often takes a back seat to the exotic boundary that carries his name. A Jewish immigrant who served as a founder of NASA’s Jet Propulsion Laboratory and as an advisory to the U.S. military, Kármán dedicated the last four decades of his life to advancing U.S. rocket design and laying the foundation for the space race. The Kármán line exists 100 km above the Earth in the thermosphere, a layer of Earth's atmosphere that you probably haven't thought of since an elementary physical science class. In this layer, solar radiation is absorbed, leading to temperatures of 2000 °C or higher. To put the height of the Kármán line in perspective, Felix Baumgartner's recent record-breaking space jump took place from an altitude of 40 km, while commercial aircraft cruise at approximately 12 km. The primate Albert II holds the distinction of being the first mammal to cross the Kármán line, passing slightly above it to 134 kilometers in June of 1949 aboard a US-launched V2 rocket. Shortly before Albert II ascended into the heavens, however, U.S. scientists packaged a batch of fruit flies on a V2 rocket. The capsule included a parachute mechanism to send the flies back to surface, and upon retrieval, the insects appeared unharmed. These insects became the first living organisms to intentionally pass the Kármán line. Once a human passes the Kármán line, the title of astronaut can be officially bestowed. 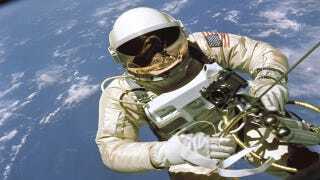 The United States actually accepts a slightly lower boundary to consider an individual an astronaut, granting the title to anyone who has passed an 80 kilometer boundary. Astronaut flight wings are also given out for commercial aviators who have passed the Kármán Line, with SpaceShipOne pilots Michael Melvill and Brian Binnie currently holding pairs of Commercial Astronaut Wings. Will you pass the Kármán line? If you have a desire to become a space tourist in the future, crossing the Kármán line (as well as how long an individual stays above it) will play a significant role in legitimizing your personal journey. While your government will likely forgo giving you a pair of Astronaut Flight Wings, you can slap a sticker on your car or laptop stating "I passed the Kármán line" and let everyone know you are a true space traveler. Top image via NASA’s Johnson Space Center and James McDivitt. Image of Astronaut Flight Wings courtesy of the National Archives and Records Administration.